"For sale is this vintage 1964 Gibson ES-175 hollowbody electric guitar. Custom-ordered in Polaris White with factory upgraded gold hardware. This is a truly rare example of a special-order one-of-a-kind vintage Gibson guitar. In addition to featuring a unique "Custom" shield placard on it's Trini Lopez style tailpiece, the guitar was also ordered with factory installed Grover tuning machines. The orange label within indicates this ES-175 was a special order instrument based upon the "Spec" written designation. Purchased from a collector who had acquired it from the original owner's family, this is an uncirculated instrument, in exquisite 100% all original condition. A must have for the exotic guitar collector or the experienced enthusiast, as you will never hear of, let alone see, another ES-175 with these special one-of-a-kind custom-ordered features. This is a no issues, perfectly intact, 100% all original custom-ordered '64 ES-175, with absolutely no modifications of any kind, no breaks, and no repairs. 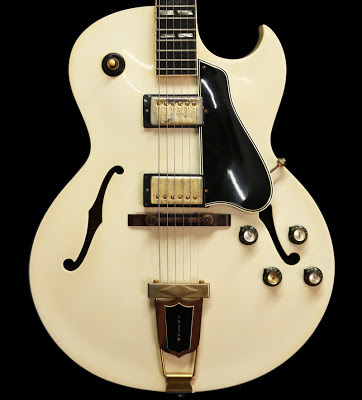 What makes this ES-175 so unique, is that it is a Jazz guitar, the appointments of which were arranged in such a non-traditional approach: specifically, the Polaris White color on a guitar which is typically Sunburst. Of all the various Gibson guitar models, it seems that Jazz-oriented guitars were almost always strictly Sunburst or Blonde, and extremely rarely are they finished in an opaque color of any sort. 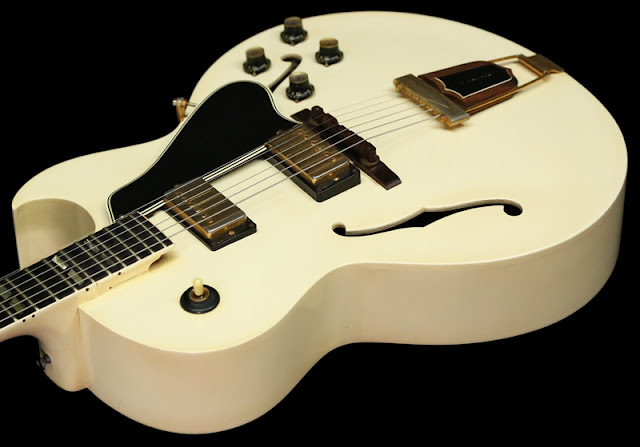 While the Polaris White color was often applied to SG Specials, SG Juniors, and sometimes Firebirds, it just wasn't a finish used to decorate an L-5, a Super 400, ES-175s, or other archtop hollowobody style instruments. Furthermore, the application technique of the finish is also completely unique, with the finish covering both the binding on the fingerboard (very common) and the binding on the body (very unusual). This uniform application is incredibly attractive and is another feature which renders this ES-175 a genuine one-of-a-kind Gibson creation. While I do not have provenance, it was suggested that a Jazz Guitarist actually custom-ordered this instrument in the above configuration, however (even though it isn't specified on the label), it is also quite possible that it was an employee-made piece, as there is the notorious "2" stamp underneath the serial number on the back of the headstock. 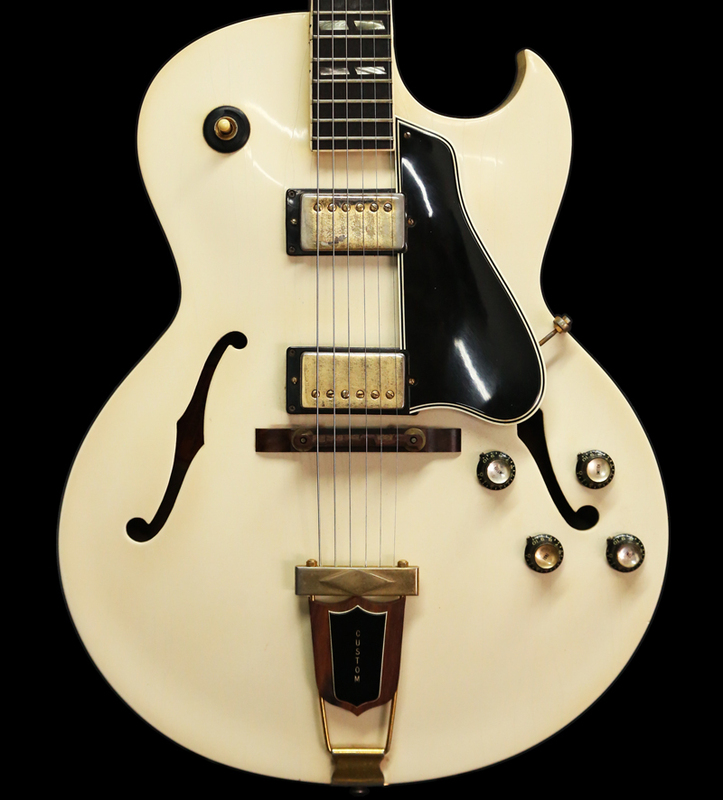 This '64 Gibson ES-175 is in 100% all original condition, and features: original Polaris White finish, original gold hardware, "Custom" plaque, original Pat. Pend. Grover tuning machines, original gold insert black top hat reflector control knobs, factory large frets (common for '61-'65 production instruments), Brazilian Rosewood bridge, Brazilian Rosewood fingerboard with split parallelogram inlays, an orange label with the "Spec" (Special) designation, a pre-'65 wide 1 11/16" nut width, (2) PAF-style Patent No. pickups, and all original electronics. While a custom-color Strat is somewhat commonplace, with a premium placed upon it in proportion to how rare the color may be relative to the standard Sunburst finish, a custom color Gibson instrument is extremely rare, and happens to command a more specialized pricing forumla. The majority of rare Gibson custom color instruments begin to appear in 1966, most of which were produced between the brief period of '66-'69. Examples of such are; Pelham Blue Trini Lopez', Pelham Blue ES-335s, and perhaps a small collection Black/Cherry hollowbodies/acoustics. Note: Polaris White was more popular during the early-'60s, which is arguably the best era for their electric guitar production quality, with the craftsmanship and specs. of which becoming decidedly less desirable as of 1965 onward. And while a '66 Trini Lopez is a very beautiful instrument, it has an undesirable small nut width (1 9/16"), lesser performing pickups, chrome hardware, etc., and is not nearly as functional as similar models made prior to '65. All of which indicates that a custom color ES-175, ES-335, L-5, etc., produced between the golden era of 1957-1964 would be an incredibly scarce and highly desirable instrument. A low production vintage Gibson guitar is very special, but an absolutely unique one-of-a-kind special order guitar is almost any configuration is worthy of a museum. Regardless of personal preference, any enthusiast will undeniably appreciate this beautiful '64 ES-175..."